The new Gyro G180 Sand Hybrid brings new technology to the short game. The stainless steel, Gyroscopic 180 degree weight ring places more mass farther back in the sand wedge's shell for fantastic stability at impact. This new weighting system pushes the MOI (Moment of Inertia) to levels never seen before in short game clubs which aids accuracy and shots out of the sand have never been made easier due to the advancements Alien's designer's have created in the G180. 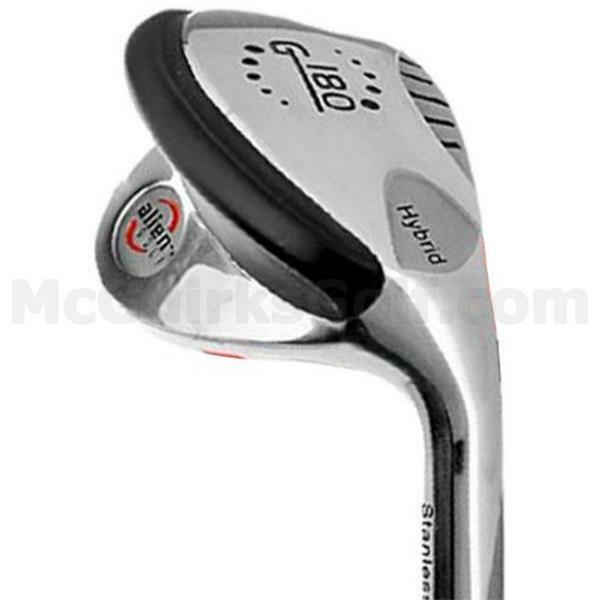 Consumer and Professional testing of the new hybrid technology found in the Gyro G180 Sand Wedge produced rave reviews. Because of the slower swing speeds that are common when approaching the green, or hitting touch shots out of the sand, golfers actually need more! not less forgiveness in their sand wedge. Classic shaped wedges do not have any forgiveness at all on miss hit shots and lead to longer approach putts if the shot actually reaches the green. Alien's G180 Hybrid Sand Wedge design places more mass farther back, and heel to toe in the club head which in turn gives the G180 incredible stability at impact with the ball. Weighting is also placed low, and below the impact zone to lift shots swiftly, and easily out of any sand, or rough you might encounter. Hybrid technology is actually most important when it comes to your short game since this enhancement of club head stability will affect consistancy, and accuracy on all approach shots you face from 100 yards into the green. This is the RED ZONE of golf to use a football phrase. Once you are within 100 yards of the flag stick, the Alien G180 Sand Hybrid will give you the technology you need to improve your score.